Si Dunn is an Austin writer and book reviewer. His reviews appear periodically in the Dallas Morning News and on the Internet. 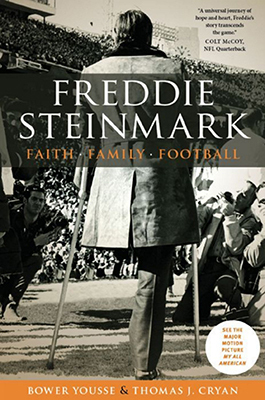 Bower Yousse is the coauthor of Freddie Steinmark: Faith, Family, Football (University of Texas Press, 2015). A close friend and teammate of Freddie Steinmark as a teenager, Yousse is a former award-winning creative executive with Young & Rubicam and other advertising agencies. Outside of the advertising industry, Yousse is a successful freelance copywriter and producer. He has written several screenplays, magazine articles, and novel-to-screenplay adaptations. Thomas J. Cryan is a media executive, attorney, and coauthor of the first authorized biography ofFreddie Steinmark. He is the author of two previous books, The Next Paradigm and 3 Principles. Freddie Steinmark was one of his team’s smallest players when the University of Texas Longhorns battled their way to college football’s national championship in 1969. Yet, on the field, Number 28 seemed fearless as he brought down big running backs, broke up pass plays, intercepted throws, and returned punts. I was among the many thousands of students and fans in the stands who cheered when Steinmark’s name boomed out over the public address system that championship year. None of us, including the fearsome safety himself, knew that he already had bone cancer in his left leg and that it would spread and lead to his death in 1971. To his many admirers, he seemed a strong, young, All-American standout with many successful years ahead. Other books have dealt effectively with Freddie Steinmark’s stellar athleticism, his brave determination to keep fighting cancer, and the way he supported the Longhorns even after losing his leg to amputation. He also became, at least briefly, a leading figure in the fight against cancer, helping spur President Nixon to sign the National Cancer Act of 1971, which increased research funding. What this worthy new book brings to readers is a closer view of Steinmark’s childhood, family life, and Catholic faith, as well as how his academic excellence, superb athleticism, and fighting spirit evolved, with help from his father, “Big Fred” Steinmark and mother, Gloria Steinmark. Co-author Bower Yousse and his family were close friends with the Steinmarks. Indeed, Bower and Freddie were teammates on youth and high school teams. Thomas J. Cryan, meanwhile, has been a close associate of the Steinmark family for more than twenty years. They received “unrestricted and unprecedented access to documents associated with Freddie,” as well as input from many members and friends of the extended Steinmark family. “Faith,” “family” and “football” do sum up much of Freddie Steinmark’s too-short life. Yet, as this book makes clear, his fuller story includes remarkable fortitude and compassion. And his inspirations to others continue, nearly forty-five years after his passing.